Subject: [Better Bot Project]: v5 Released with Riverfolk Company bot! IMPORANT NOTE: I cannot upload version 5 on BGG. BGG is still hosting v4. You can find v5 on Dropbox (see download section below). Update 01/03/2019: Click here for the announcement from Marshall that BBP will become an add-on expansion in the upcoming Kickstarter. This means more development, better visuals, and professional components instead of print n play. To support this the bots here will be marked as "Final" as soon as they are stable, while development in cooperation with Leder Games will continue to provide a higher quality product. Root has been a fantastic experience and is definitely one of my favourite games. However, I found that the solo and coop experience was lacking. The MM is severely random due to the recruiting. I also wanted to be able to include more bots to be able to play the Marquise and have 1-2 bots for a more dynamic playing experience when there isn't enough players for a full game. I'd love for you to test the bots and provide feedback on what you like and don’t like about them. - The files are A4 for printing. The cards reflect the actual size of cards in Root, while the player boards are slightly smaller as they exceed A4. Make sure to print as original size without fit to page. - Please refer to the "Law of Bot" file which runs through each bot in detail with an example turn! - That being said, all information is actually on the board and the rulebook is technically not required to play. - All bots have a double-sided board with setup instructions on the other side. They differ for most factions and should be used to setup the game correctly! The MM2.0 has a slightly adjusted action flow and doesn’t gain any extra points based on the number of players. The key change is that it places building tokens and then scores points based on how many buildings it has of the same type. It also recruits before it moves leading to more dynamic map behaviour. 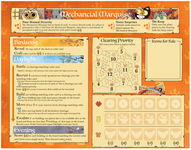 If a bird card is revealed the behaviour is slightly modified to make the game less predictable. The WA bot went through many drastic changes but is now in a happy place. The turns are quick, the pacing reasonable. Make sure to read the Revolt and Spread Sympathy sections in great detail and check the Law of Bot for a detailed example turn. 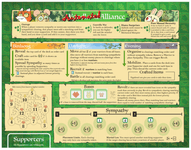 The Automated Alliance will require constant attention from the player and if not kept in check will run away with the game. It has been rightfully compared to a whack-a-mole game. Version 5 is a complete rework of the EE due to the high fiddliness of previous versions. Similar to the previous rework of the AA it removes the key resource management of a human player and takes a more arcade approach to it. The new EE plays faster and is more deadly. Go for a classic Marquise vs EE v5 and see what I mean. The bot for the Vagabond is slightly higher in complexity, but has remained near unchanged since its creation. That being said the Robot Raccoon does his job very well. Each turn draw a card that dictates (based on the suit) what 3-4 actions the bot will try to complete on its turn. If he can't complete an action in full he will skip it and move to the next. The items exhausted for the actions are all wildcard, as in each items grants an action and it doesn't matter what is printed on it. E.g. if the RR needs to move 2 areas and then battle a player he has to exhaust a total of 3 items. It might be Coins, Bag and Crossbow. Also the RR doesn't need swords for rolled hits. Instead it has a short combat track on which it has to place its 6th, 9th and 12th items. The 6th and 9th increase his rolled hit maximum to 2 and 3. The 12th item adds +1 Extra Hit when attacking. This is meant to recreate the bizarre strength a fully equipped Vagabond player would bring to the table. Finally, the Raccoon doesn't bother with relationships. Robot Raccoon don't care. Each aid given grants a point and each pieces removed in battle grants a point. It will occasionally aid the player with the lowest score, but mostly relentlessly hunt down whoever is in the lead. In solo 1v1 games this can be painful, especially as he goes for clearings with the most tokens, then least warriors. On the other hand if playing against multiple bots the RR becomes a balancing force. 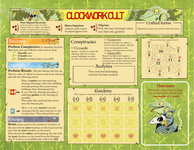 The Clockwork Cult is very similar to the Lizard Cult, but adds a lot more pressure for other players. They key difference is that Lost Souls and the Outcast suit have been replaced with an Outcast pile. The CC maintains a face-down pile of up to 5 cards as "Outcasts". Any cards that players discard get added to the Outcasts pile if there's less than 4 cards in it. The version version of the Otters seem to work well so far. By design they dictate the pace of the game and force players to interact with them -- either by trade or by force. While the individual turns of the OO are quick, part of their turn plays out on each opponents turn as they buy services. 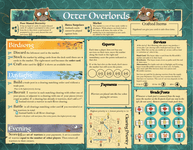 With the OO comes a package that also allow to play the Riverfolk Company against bots, although it won't be as enjoyable. However, this will make the Riverfolk more playable at small player counts with bots (e.g. 2-3 players and 1-2 bots). So, have you given thought about playing all 6 bots against each other? Could be revealing. I tested the 3 finished bots against each other and it ended with 27 (EE), to 31 (MM), to 32 (AA) - I did give them an equal amount of turns. Since then I slightly adjusted EE and did another 2 solo game tests. So I assume it would be even next time around. There's no problem with safe external links, and is probably much more useful in an evolving project like this. I'm curious to see how this will turn out. This is getting dangerously close to my fantasy scenario of just watching bots tear into each other for a full hour. I'll give it a go as soon as I get my copy. Really like the concept. Haven't played the original MM yet but as a solo player this is right up my alley. Psst, OP, the MM is a she, like countess or baroness. I kid but I also applaud this effort as I do all the people making fan factions. Very cool and I long for the free time to try some of this out. Maybe a purchase + shuffle to allow their card order to remain more mysterious. The current one, as in the new (second) one. So, only 1 card per evening phase, right? Yes. It can lead to the odd scenario where the first card would have scored 3 points but due to escalate the second card now only scores 1 point. In return the cat gets to bring in another 4 warriors, do some battling, etc. 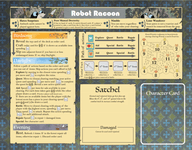 I added the first version of the Vagabond, which means the base game factions are all there. Enjoy! It should be "it" like a mechanic device. I see I messed this up everywhere. To be changed in the next version. Have you considered adding a system for the AI to purchase cards off of the river folks? I haven't even started the Riverfolk bot yet, because of exactly that complexity. I think doing the Lizards and providing better balancing (and streamlining) for all 5 bots will be easier than the Riverfolk. However, if we go with your idea we could make it work: Each bot could have a condition on when they buy as well as what happens. e.g. MM buys Mercenaries unless he's got 1+ more warriors than the opponent he attacks. If MM has more than 10 warriors left in his supply he buys a card (matching order card) and adds 2 warriors into the clearing with the least warriors. MM also considers rivers for movement and if the target clearing requires going via boat it pays for it. On the other side the Otter bot just escalates the prices based on his VP. Means they'll always go up. +1 at 10, 15, 20. 1) Are mice, rabbit and fox favor card’s used? 2) Are spy or dominance cards used? 1) Yes. If you find it too easy with them try either adding more upgrades or removing the cards. 2) Spy cards don't have an effect, so no. Dominance cards don't work solo or coop. I tend to leave them in the deck for convenience reasons the same way ambush cards don't do anything and stay in the deck. I've uploaded a rulebook ("Law of Bot") and updated versions for all 4 bots. This should help using the bots. Most changes are odd spelling errors and clearer use of language. Woodland Bot has a slight change (bonus VP if all sympathy is on the map). So I tried the automated alliance and I just had a question with sympathy placement. So the order of placement is matching the order card then highest priority. Is highest priority meaning the largest number or lowest number? I would think the largest number but I read your law of bot and it has it listed the highest priority is the lowest number so I'm confused. 1 is highest priority, 12 is lowest priority. 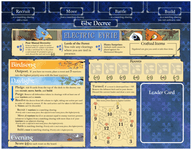 This is based on the Mechanical Marquise from the Riverfolk expansion. I thought about flipping it but everyone who tried the original bot would be confused then. I'll make sure to add it to the instructions in the next update. I was looking at the rules for the mechanical Marquise and the player board and it only ever refers to priority as lowest number and highest number so it would make more sense to keep those consistent with "highest priority" being highest number and vice-versa. "Step 2: Move. Starting with the clearing with the lowest number in the Clearing Priority box (1, 2, etc.) and going up, move from clearings you rule with four or more of your warriors. For each move, move all of your warriors except for three from the origin clearing. The destination is the adjacent clearing with the most enemy pieces, then the tied clearing with the lowest number in the Clearing Priority box." Take moves from lowest to highest number." "Move all but 3 of your warriors from clearings matching the order card, following clearing priority. Destination is the adjacent clearing with the most enemy pieces, then with highest clearing priority." Yeah after reading the rules and the player board highest clearing priority is the lowest number. It's a little misleading and should have had better clarification on the player board. The language around priority of moving to or from a clearing wasn't clear, same for battles the priority of target clearing and target player wasn't clear.